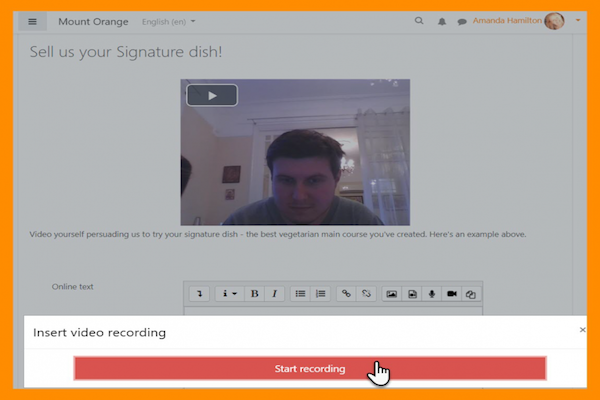 You can now record audio and video directly in the Moodle editor! From Moodle 3.5 the default Atto text editor has the ability to record audio and video directly from your browser. Note that it works well with Firefox and Chrome, but it will not work with macOS Safari, because that browser is built on a different underlying technology. Once enabled (by the site administrator) the Atto editor has two new icons on the toolbar. When you click on one of these, the browser will verify access to your computer camera and/or microphone. This new feature allows you to add video and audio wherever the Atto editor is available (and you don’t need a plugin such as Poodll for simple media work now. Students can use these new options in Blogs, Books, Forums, etc. Both icons will display a “Start recording” button that when clicked will then bring up a recording window. If you choose video you will see your camera feed. Start recording and when you are finished you can review the recording. When you are ready to save, click on “Attach” to add it. Stuart is interested in all things e-learning, with specific interests in Moodle, e-learning strategy, and business development.His experience in education over 30 years, MBA in International Business, and knowledge of e-learning systems implementation, together with graphic design background, give him a unique skill set for e-learning projects. Stuart is interested in all things e-learning, with specific interests in Moodle, e-learning strategy, and business development. His experience in education over 30 years, MBA in International Business, and knowledge of e-learning systems implementation, together with graphic design background, give him a unique skill set for e-learning projects.